Cover a rimmed baking sheet with foil. 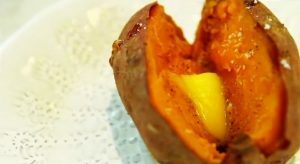 With a fork, pierce the sweet potatoes all over; place on foil and bake until fork tender, 45-60 minutes. With a sharp knife, cut a line down the center of each sweet potato, gently squeeze the ends to open. Top each sweet potato with 1 tablespoon butter and 1/8 teaspoon salt. TIP: Sweet potatoes caramelize better if not wrapped in foil.